Tax ID# TA-085-120-8192-01. Permit # STWM2013/0009 . This amazing 6000 sq.ft. home is so comfortable and luxurious. You'll feel like Hawaiian Royalty with unparalleled views of sunsets, whales, turtles, and stars. The spacious landscaped acre gives you much privacy to enjoy the oceanfront pool, hot tub, bbq, and outdoor dining area on the quartzite flagstone lanai. The 5 bedrooms of the main house all are equipped with central air conditioning, flat screen tv's (digital cable), en suite bathrooms, beautiful furniture, amenities, linens, shampoo, conditioner, body wash, hand soap.... just bring your toothbrush and bathing suits. 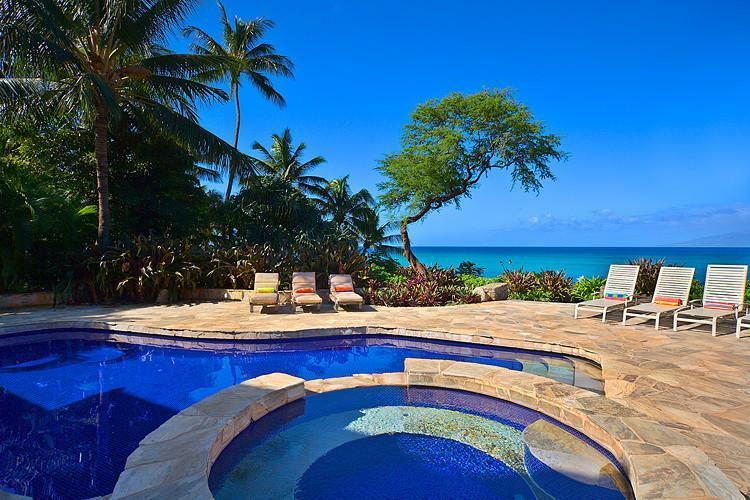 This property is unique in the fact that it is very large, private, comfortably accommodates up to 12 people, and is located so that you can enjoy the tropical trade winds and see the sunsets year round. There is a sandy enclave on the property situated directly on the oceanfront perfect for lounging, reading, sun bathing, and playing with the kids. There is plenty of driveway parking and additional parking at the top of the property. The main home has 5 bedrooms with two beautiful and newly renovated master suites, one downstairs and one upstairs, There are 2 queen beds in the downstairs bedrooms and a twin and full size bed in the 5th upstairs bedroom. A separate guest suite is available for an additional $200/night complete with a full kitchen, queen size bed and a queen size sofa sleeper in the living area. $4,000 - $6,000 per night. 50% down to hold a reservation. Balance due 90 days before check-in. $5,000.00 security deposit. $1,086.99 cleaning fee. 4% processing fee. Listed rates do not include tax. Holiday and peak season rates and required length of stay may be different than quoted above. Credit cards, cash, checks and wire transfers accepted. Minimum night stay varies amongst the various rental units. Many rentals have 30-night minimums. Permit number: STWM2013/0009 . Tax number: TA-085-120-8192-01. We have rented a number of Villas and Houses, mostly in Europe and this was the finest we have experienced. The house is absolutely fantastic both in design and location. We were a family of 11 and cooked most of our meals. The kitchen was compleat in every detail. The Concierge, Thomas, booked us a fishing trip and Luau and both were memoral highlights. This was our 60th anniversary and we couldn't think of a better place to celebrate this event than the Kahana House. This was the first time we leased a house on Maui. We found the qulaity of the Kahana Hosue to be excellent. There is always and were some things that either were not working (barbecue) or that we needed additional assistance to operate. Both Courtney and Hans were excellent in their immediate attention and assistance. Condition and cleanliness was great. We were totally satisfied with the house and the attention given to us by Courtney. Here followup was excellent. Would definitely recommend it to our freinds.